Hurricane Irene, Mary and Cameron. We’ve had a lot of hurricane inquiries, and I just wanted to put the word out there that Jamey and I are cool, calm and collected. (I am sure he will argue differently about myself, but he can blog about it if I really get hysterical.) We’ve had some weird weather in these parts this year, haven’t we? Luckily, I ducked out of work with the rest of my office at noon today, since schools are closed, winds are high and people in general are just worried (and not driving as attentively, as a result). Right now, it looks like Irene is going to keep moving north past us. All we have experienced today is high wind and quite a bit of rain. (I’d take a picture of our front yard for you, but it just looks like rain. I figured your imaginations can put the rest of that vision together.) If anything, we’ll probably just move our vehicles into a covered garage and camp out for the night, but our thoughts are with all our friends up the East Coast who might see worse. Keep us posted on what happens with all of y’all on that route. 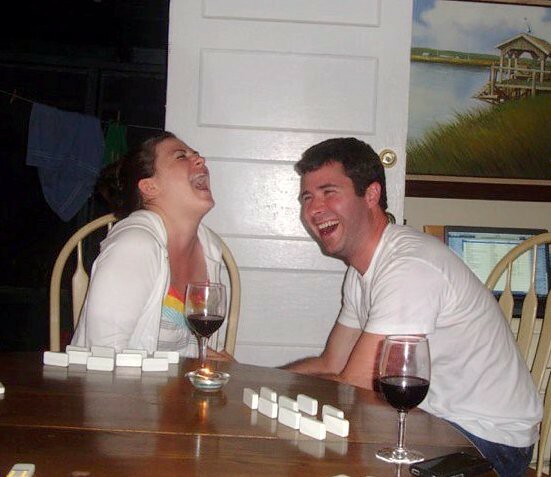 As for us, we are going to North Carolina tomorrow for the wedding of these crazy lovebirds! Mary & Cameron from beach weekend last year. I have other pics, but this one just sums up their love quite well! 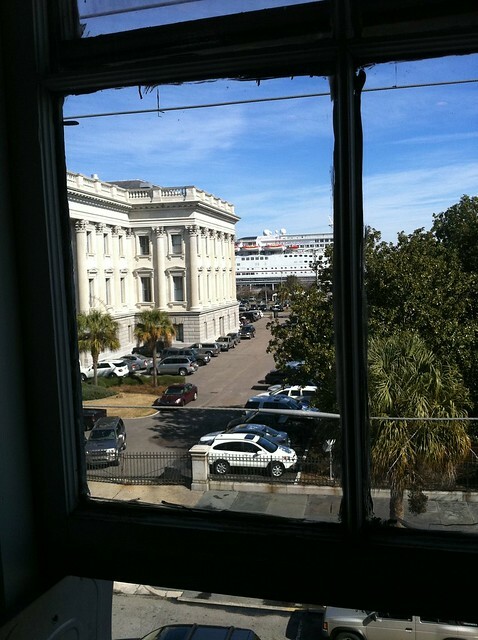 Every once in a while when I’m cruising around Charleston, I get a whiff of Georgia. This was irresponsible photo-taking, but isn't it cool? 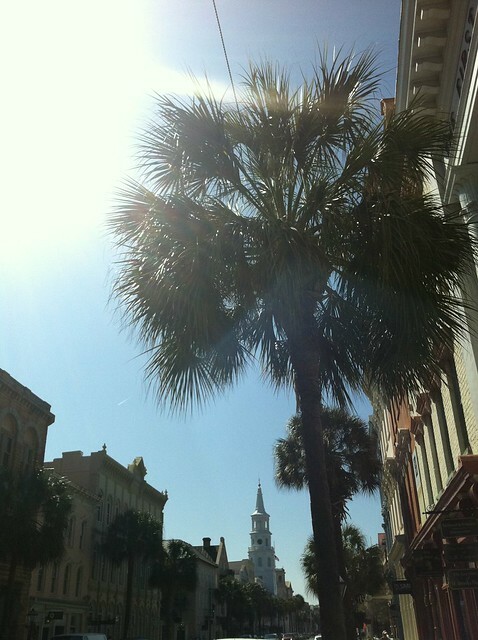 In other news, the sun has finally decided to descend upon Charleston once more. It is a good sign for things ahead and races tomorrow, along with visits from friends, a potential Firefly Distillery tasting Saturday afternoon, and Jamey’s return home. 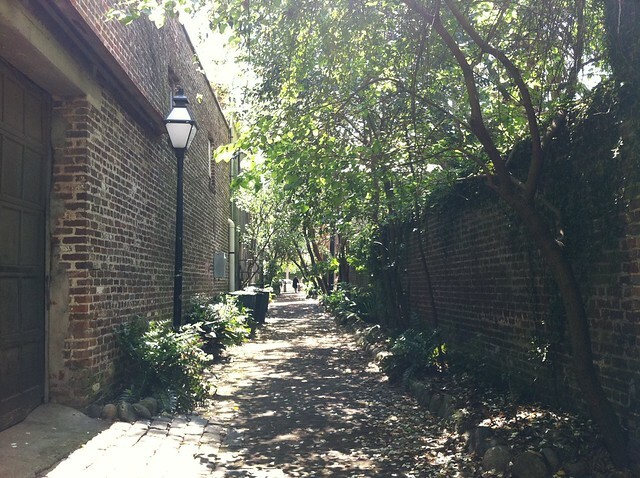 My favorite street in Charleston today. I’m not always mushy mush when he heads out of town for work, but I think visiting this blog incites those sentiments. Updating you on our going-ons leads me to think of him, and so of course mushiness is bound to ensue from time to time whenever I miss him – even if he’s only gone for a few days. Basically, I’m just ridiculous. I guess it’s going to take us bickering over something for me to tamp down those feelings, but even then Jamey finds ways to amuse me. So until the next installment in the lives of J&C, have a great weekend. Let’s hope I have enough energy to write a post for you for Monday! Your name is James, and you’re on a business trip in Somewhere, Pennsylvania on a Wednesday near the end of March. You’re cold, but you’re not one to complain because you’re tough. And when you’re tough, you mean business, which is why you’re there so it all works out. A cold, dark scene awaits. Perhaps some derogatory thoughts enter your head, and you wish for home. Can you feel the sea breeze? But it’s 72 degrees outside and the window is open. All I need is a free ticket on that cruise ship, and I’m good to go. Happy snow day, Ohio, Chicago and Boston! 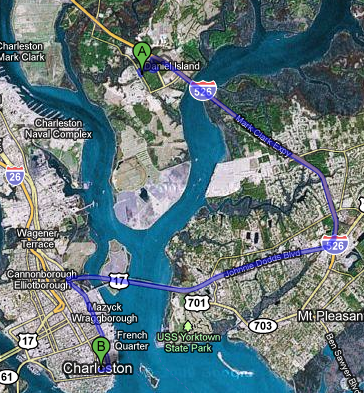 Today Charleston was hit by the same winter storm that’s sweeping the South East. 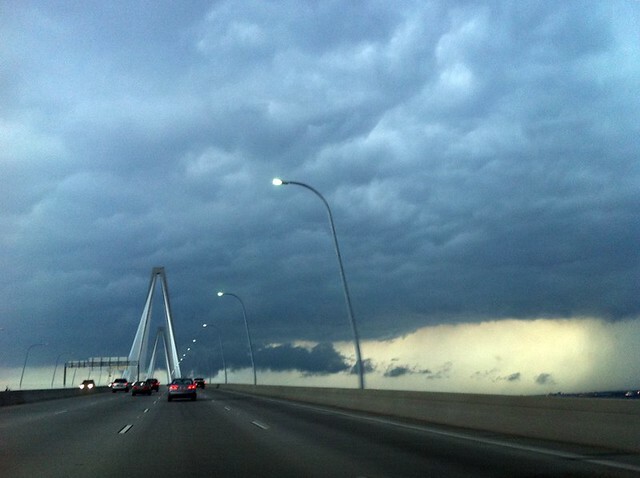 But in typical Charleston fashion, our storm has it’s own flair. It takes about 20 minutes and can be really pretty. I cross the harbor and can see the sun come up. Occasionally I even get to drive over a fog bank, those are the coolest times. That’s what I had on my way to work this morning. It was cold and rainy, but still only took about 20 minutes.